The MS2661C Portable Spectrum Analyzer is for signal analysis of radio and other equipment related to improving frequency usage efficiency, higher modulation, and digitalization. 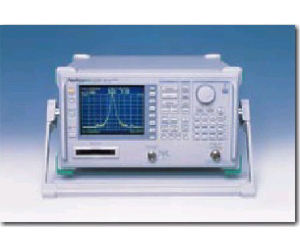 This is a synthesized spectrum analyzer covering a wide frequency range from 9 kHz to 3 GHz. It has superior basic performance such as high C/N ratio, low distortion, and high frequency/level accuracies and is easy to operate. It has a Measure function for evaluation of radio equipment (frequency counter, C/N, adjacent channel power, occupied frequency bandwidth, burst average power, and template decision function), and which enables the two-screen display and FM demodulation waveform display. The large selection of options means that a wider range of applications can be handled at reasonable cost.